Gain the practical experience needed to jump start your legal career. Earn credit and develop professional relationships while working in premier placements across the country. Our robust programs provide the flexibility you need to tailor your experience to your career goals. Improve research, writing, and legal analysis skills. Learn how to identify and adapt to the culture and expectations of a work environment. Build a professional network within the legal communities and location you plan to practice in. Can't find a placement that fits your goals? Already have an opportunity you would like to take for credit as an externship? Talk with Director of Externships Kim Wolf Price. Academic: Students are eligible to participate beginning their 1L summer. Students must be in good academic standing (minimum GPA of 2.2) at the time they apply and throughout the course of their externships, and must satisfy the Professional Responsibility pre-/co-requisite (LAW 647 as a 1L elective or LAW 746). Seminar: All externship students must enroll in the accompanying lawyering seminars. Each seminar examines the complex operations of the legal profession and relevant new lawyer topics and includes written assignments. Students will work together, present in class, hear from guest panels and distinguished lecturers, network with local legal community members and alumni, and reflect on the transition from classroom to practice settings. Travel & Housing: Students are responsible for securing housing and travel to and from their program's city as well as to and from their placement. In larger cities, it is recommended to live nearby public transportation. Our alumni network spans the entire US and we continue to develop new opportunities for our students. Explore the programs below to find out which best fits your career goals. Placements are available from local, state, and federal judges, in government offices, non-profit organizations, law firms, corporations, and more. -offered every Spring, Summer, and Fall. Recruitment occurs early each Spring semester for all options the following academic year. Applications are managed through an interview session on the College’s Symplicity platform. Fall, Spring: 2 credits (112 hours) or 3 credits (168 hours) part-time for NYEx Placement; 12 credits (540 hours) full-time NYEx Placement; 2 credits for NYEx Seminar. Summer: 3 credits for part-time NYEx Placement or 5 credits for full-time NYEx Placement; 1 credit for NYEx Seminar. 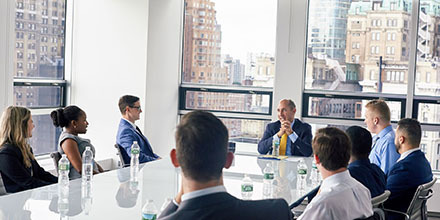 Experience law in the Big Apple, the United State’s most populous city, working at placements like the NYS Attorney General’s Office, Constellation Advisers LLC, DLA Piper, and federal Judges. Spring: 12 credits for NYCEx Placement; 2 credits for New York Lawyer Seminar. Summer: 5 credits for NYCEx Placement; 1 credit for New York Lawyer Seminar. Get a taste of the US capital’s unique legal environment in Washington, DC. Work at the US Department of Justice, the US Securities and Exchange Commission, on the Hill with US and State representatives, for the FBI, NASA, Planned Parenthood, at law firms, or at one of many other prominent placements. Spring: 12 credits for DCEx Placement; 2 credits for Washington Lawyer Seminar. Summer: 5 credits for DCEx Placement; 1 credit for Washington Lawyer Seminar. Philadelphia is one of the nation’s most historic cities and a perfect place to gain experience with public defenders, public interest agencies, and private law firms. Spring: 12 credits for PhillyEx Placement; 2 credits for Philly Lawyer Seminar. Summer: 5 credits for PhillyEx Placement; 1 credit for Philly Lawyer Seminar. ​Spend the summer abroad in London, one of the world’s most dynamic and historic cities and gain a comprehensive understanding of the rich legal tradition that produced the US legal system. The College of Law has maintained the prestigious LondonEx program for over 40 years. LondonEx emphasizes a comparative law immersion, where students can learn the fundamental tenets of English law, emphasizing its institutions, profession, court structure, procedure, and substantive law. -LondonEx is offered every Summer for 4 credits.